The smart, compact wireless router integrating satellite communications, 3G cellular and WiFi connectivity. The Red Box provides a unified onboard communications platform featuring least cost routing, wireless NMEA instrument data, firewall, enhanced GPS tracking and crew email & web optimisation. Through the innovative and well established teleport-mail and teleport-proxy services, the Red Box provides data transfer rates up to 10x faster than standard rates, allowing for lower user costs and encouraging increased usage through all connections, including satellite. 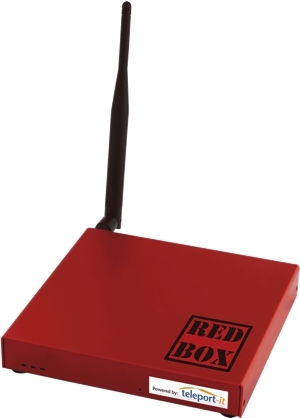 Email and surf wirelessly, by using the Red Box as the onboard WiFi Hotspot. Utilise 3G, WiFi, satellite broadband and satellite dial-up for uninterrupted wireless Internet worldwide. The Red Box uses the teleport-firewall to restrict web access and lock down the computer to optimise data speeds and traffic, lowering the risk of overspend. Email up to 10x faster via satellite in an easy to use format. Spam and virus filtering plus smart automatic attachment blocking enables stress free emailing on the move. The ultimate web proxy for fast, cost effective web browsing. The teleport-proxy recompresses images and compacts HTML web pages to achieve up to 5x faster web browsing capabilities over low bandwidth connections. Individual or group travel blogs that can be updated via satellite or other Internet connections. Integrate photos, GPS position tracking and personalise the layout of each post. Group teleport-blogs for large events or races are available. Global weather forecasts straight to your inbox. Many formats available, including GRIB and Synoptic Charts. Perfect for easy access via satellite Internet.